History of Hexham Racecourse - 1890 onwards. View PATHÉ NEWS ARCHIVE FOOTAGE of a race meeting in 1922 - more details lower down the page. In 2015 we celebrated 125 years of racing at Hexham and it is well worth considering that without the determination and foresight of one man racing might not even exist at Hexham today. That man was Charles William Chipchase Henderson a popular, respected figure and Durham businessman whose Family founded the Durham Carpet Company. Apart from his prowess in the saddle he was a sporting man in every sense of the word, excelling at all equestrian events including polo which flourished in the Newcastle upon Tyne area at that time. He had more than a passing interest in County Cricket and was a regular recipient of rowing trophies at the Durham Regattas of the day. In the late 1880’s the only notable steeplechasing in the area was at Rothbury and Newcastle and little is known of the first race meetings at Hexham before 1890. 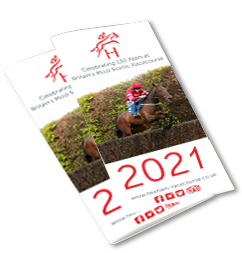 However, in that year the official form book records the first known results from a Hexham meeting held on Wednesday 23rd April when a 6 race card attracted a total of 31 runners. The two key figures in instigating the meeting were Charles Henderson and Sir Loftus Bates. Although there is evidence to show that there was racing in Hexham in 1793, it was early 1890 when a small group of local influential gentlemen decided that an effort should be made to reintroduce racing and they turned to Charles Henderson whose family by this time had sold the Durham Carpet Company and moved to The Riding near Acomb. To help them realise their ambition, Mr Henderson undertook the entire responsibility of the course management and threw his heart and soul into the venture together with a substantial amount of his own money so that the course was ready for racing in April 1890. Subsequent events and the success that followed more than amply proved the wisdom of their choice. In 1907 ‘CWC’ as he was more affectionally known bought the racecourse land and made further improvements, which included planting the unique copper beech hedge wings which remain today making the obstacles rather special. In the same year the Town and Trade of Hexham presented the Heart of all England Cup for a Steeplechase of that name and which has been competed for ever since at the early May meeting. The window frames and guttering and all the buildings were painted blue and yellow in CWC’s racing colours who always had a number of horses in training himself and his gallop still exists. racecourse into a private limited Company whilst retaining the controlling shareholding. Racing at Hexham survived the First War and flourished particularly in the 1930’s when further substantial improvements and additions were made. The course also survived the Second World War when the premises were requisitioned by the War Department and used as an ammunition depot, with the Company interests being looked after by William Patterson (on the right of the photo) until cessation of hostilities. When racing resumed again in 1946, William’s son, Kit Patterson, left on the photo, one of the great men of Northern Racing, ran Hexham as well as several other courses for over 40 years until 1990. Almost 100 years after ‘CWC’ created Hexham Racecourse his great grandson Major Charles Enderby returned from a military career spanning over 20 years, which took him to many parts of the world including Cyprus, Northern Ireland, Germany and throughout the UK. In 1990 Charles took over the running of the racecourse from Kit and led the team until 2016 focusing his attentions on ensuring its future for generations to come. Since then major improvements have steadily followed and continue to do so today. What the subsequent 125 years may bring is open to speculation, but we sincerely hope some form of the ‘Sport of Kings’ will still attract crowds to Yarridge and the copper beech wings remain. In 2016 Hexham Racecourse was bought by Hexham and Northern Marts, another local company, which like the racecourse has a history stretching back more than 100 years. Being local, the Mart fully appreciates the importance of continuing to develop the racecourse as a first-class venue for regular race-goers and visitors to Hexham, which in turn benefits the economy of the local community. In April 2017 the Racecourse Office was relocated to the racecourse itself at High Yarridge. You can view a fabulous silent clip (approx 2 mins) of Hexham Races in 1922 from the Pathé News Archive by clicking on the image below.